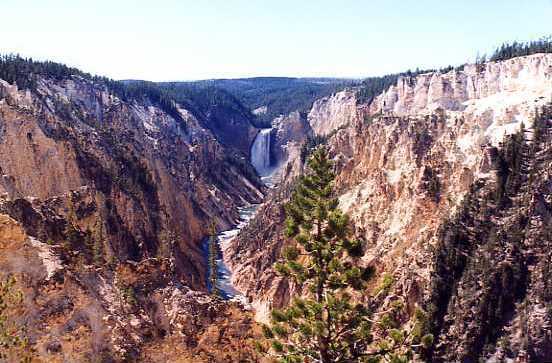 We started our sightseeing by driving East and North past West Thumb and to the Grand Canyon at Yellowstone. This drive took a while, because the shorter route (the Norris Road) was closed for maintenance. However, the scenery was worth the extra drive. One of our stops was the Kepler Cascades, which features a wooden footbridge over the Cascades and is a magnificent waterfall. 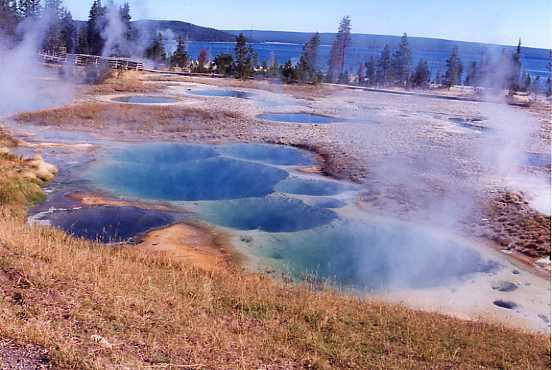 We also stopped at West Thumb Geyser Basin, which features a number of pools in addition to some small geysers. While we were there, a Pronghorn stopped by for a visit (see the center of the second photo). 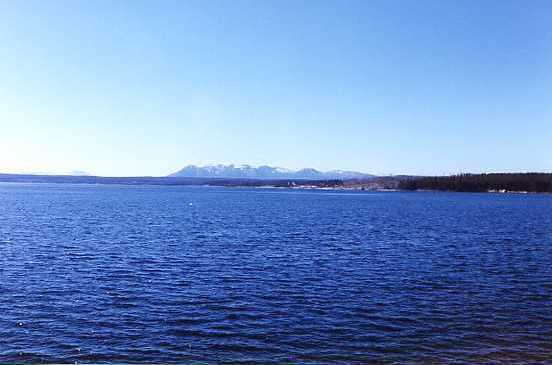 Along the road bordering West Thumb (the westernmost part of Yellowstone Lake), there are a number of scenic turnouts. 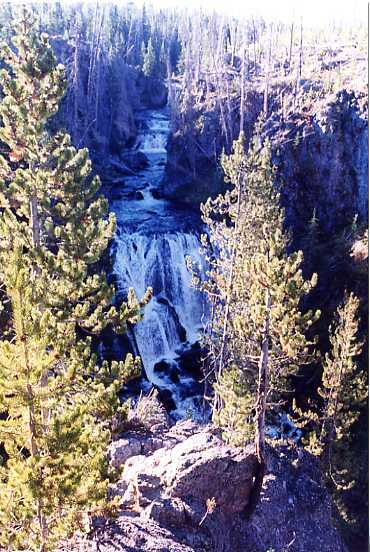 Each features spectacular views. 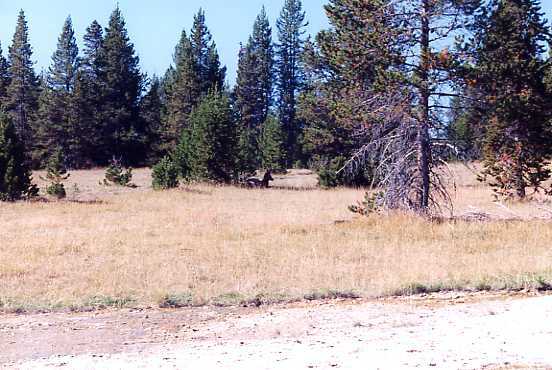 This is looking across West Thumb back to the Geyser Basin. 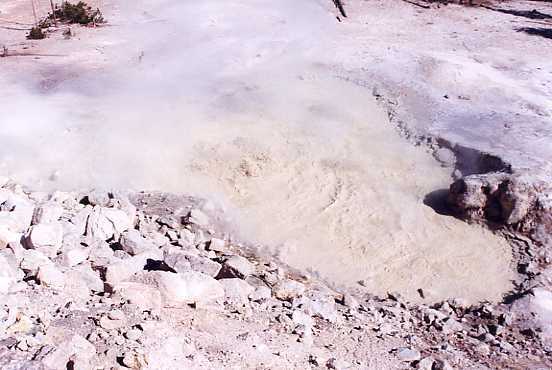 One of the most "aromatic" stops was to Sulfur Cauldron. 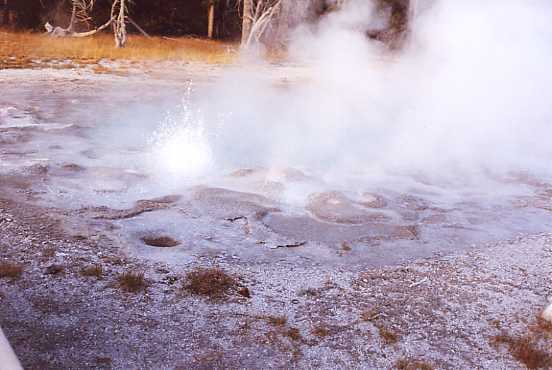 While most of Yellowstone has a distinct sulfuric smell (it is, after all, a volcanic area), Sulfur Cauldron has to be the strongest-smelling area. 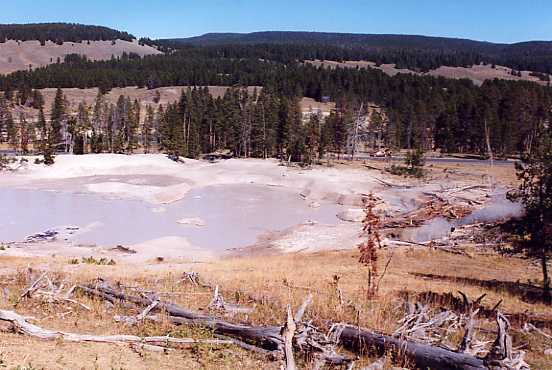 It is full of "paint pots" (small pools of sulfuric water or mud). 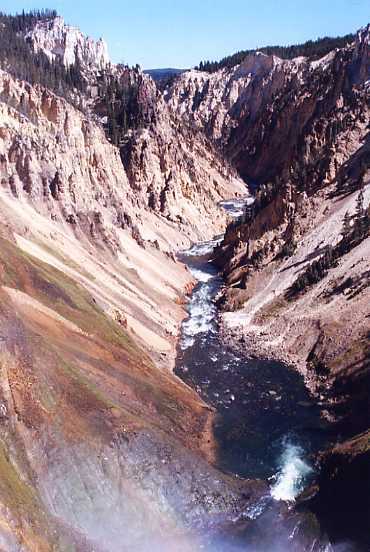 From there, we proceeded on to Inspiration Point (one of the best vantage points overlooking the "Grand Canyon of the Yellowstone"). 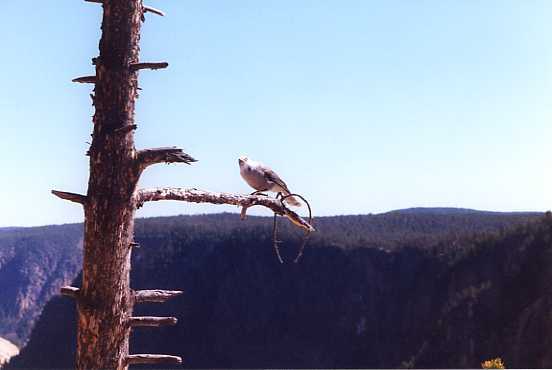 All of the pictures below are from various points along the Grand Canyon, where we did a LOT of walking up and down from the Canyon Rim. We did two trails. 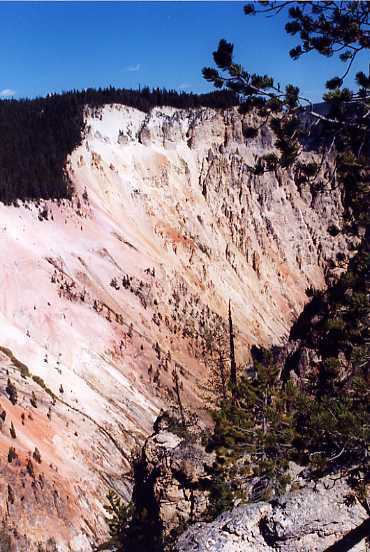 The Red Rock Point trail was a 500-foot drop in about 3/8ths of a mile, and the Brink of Lower Falls trail was a 600-foot drop in about 1/2 mile or so. The drop wasn't too bad, but you have to climb back UP afterward. After 1,100 feet of steep climbing (both up and down), we were pretty tired. 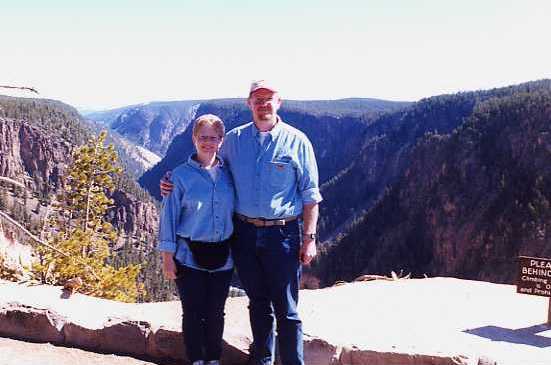 The thinner air at elevation didn't help, either (the Grand Canyon rim is at about 8,000 feet above sea level)..
Our next stop was the Mud Volcano area. This is an overview of the area. After some more touring (choosing our stops based on how SHORT the walks were), we got back to the Upper Geyser Basin had dinner at the Old Faithful Inn (fantastic!) and decided for some reason we still can't figure out to WALK SOME MORE. 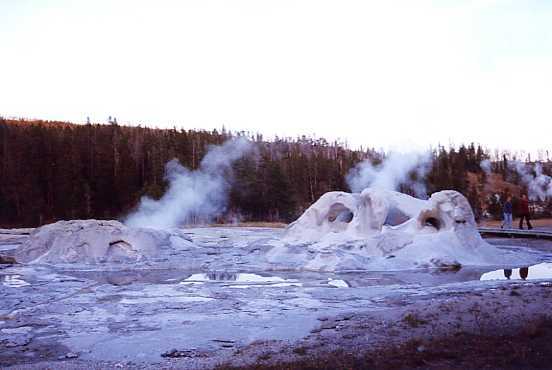 We stayed on the level areas of the Basin and got an overview of some of the geysers, such as Spasmodic Geyser and Grotto Geyser (both pictured below). As conditions looked right for a really good sunset (the cloud cover was about right), we hung around at the lower portion of the Basin to watch and photograph the sunset. 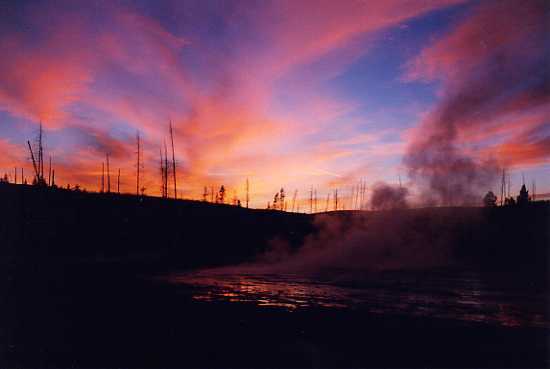 This sunset photo was taken over a small unmarked geyser next to the Firehole River. Then it was time to limp back to our cabin and collapse.